I AM A STALLION TRAINED FOR WAR. From the moment the battle-scarred horse Bucephalas allows a prince and a runaway girl to sit on his back, he is bound to them forever. The prince is the young Alexander the Great, who he proudly carries into battle, blazing a trail to the very edge of the world in his search for glory and adventure. The girl Charm is a lowly stable hand who brushes away the ghosts Bucephalas sees and forgives his arrogant ways. But unlike Golden Alexander, Charm has darker reasons to stay by his side. It is definitely a book worth reading!!! This is probably the best book that I have ever read! It does have a sad ending but I love it! This book sounds great! I hope the Kindle store has it. If not, there will be one very unhappy girl in the house! This book is amazing. Brilliantly written with a fantastic, accurate story line. Enough said. I LOVE this book so much! I found it at a dollar store, and begged my parents to buy it for me. When they did, I finished it on the car ride back home (about an hour). I've read it about 7 times (literally) after that. In fact, I'm in the middle of it again right now! The only part I didn't like is how Alexander died, but Bucephalas didn't. I wanted them both to be ghosts together. But it was a FANTASTIC book, and I highly recommend it to any horse lover that likes a bit of history too! It is my favorite book. Ever. I got this book at the library when I was looking for a scary read with my friend during Halloween (I thought it was scary 'cause on the back it mentioned ghosts), so I certainly didn't expect it having anything to do with Alexander the Great. But once I started reading it I couldn't stop then I read it again and rented it 6 mores times!! Finally at Christmas my mom got me a copy. This is certainly, without a doubt the best book I've ever read (excluding series though). I highly recommend this book to any one who enjoys a challenging, heartbreaking, slightly educational, horse story. This was an AMAZING book!!! I loved the view point of a fiery, bad tempered stallion. The only thing I did NOT like is the human characters sometimes grated on my nerves a little. Alexander with his arrogant toad personality (though he probably was like that. :P )and Charmeia with her blubbering about peace. Besides that, I would recommend this book to anyone! I got this book for a Christmas present from and ancient unknown relative and skeptically read it due to the horsey title. I now read it all the time and always use it for book reviews at school and such. Not exactly realistic in parts but beautifully written and gripping. This book is so good, I couldn't stop reading it. this is one of the best books I have ever read! Bucephalas somewhat reminds me of my own horse Nahvar. lol. It is very catching the way it is written from the horse's point of view and bucephalas has such a funny personality. I would rate this book 15/10 it is an honestly great story not to mention it teaches you a little about history. THis book is so good! when i first read this book i didn't know it was about Alexander the great. But i looked it up and found out who he was. I was so excited. The end is so sad! i cried. this book was really good!!!!!!!!!! it really was an interesting spin on Alexander the Great. This book sounds sooooo cool! 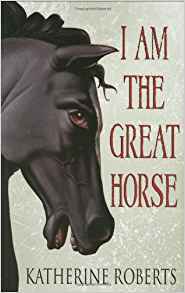 This is definitely one horse book I am going to check out. Here's seriously hoping the Heartland Library system has it! Wow! This book sounds awesome! I can't wait to read it! I read this book and i loved it. I cried at the end tho .. x lol! This book was amazing.. !!! I haven't heard of this book before and I'd like to read it. I'll let you know what I think when I do.